The United States Bureau of Labor Statistics, or BLS, ranks New York as #5 in the list of top states for medical assistant employment, with between 13,890 and 82,450 medical assistants working in the state. 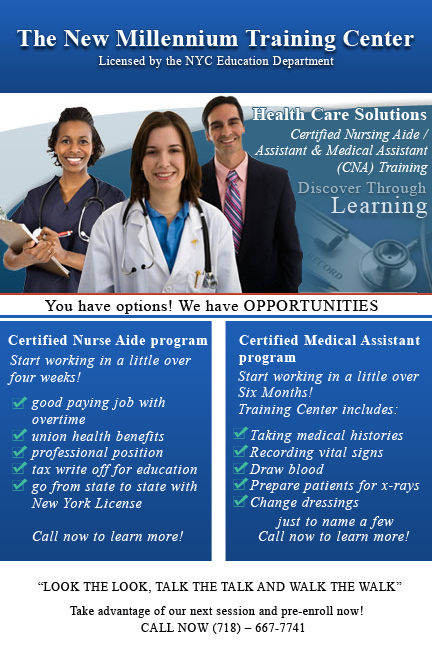 In addition, the BLS reports that the average starting salary for a New York medical assistant is between $38,400 and $42,600 (starting position for a CMA), which places the state in the highest range in the country, and well above the national average. In NYC average Medical Assistant salary is about starting at 38K - 44K. Many offices pay benefits, 401Ks and vacations. Thinking about becoming a Registered Nurse ?? Not sure if you are ready to commit to 2 to 4 years of Nursing School yet ?? 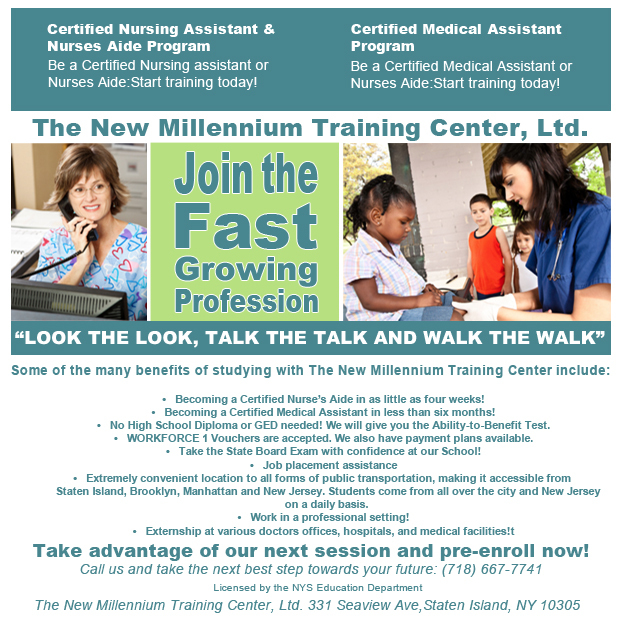 Why not work as a Certified Nursing Assistant first and see if Nursing is the career path for you ?? More facilities contact us to send them people than anywhere else !! "We are the school where people get hired from"
In today’s volatile job market, it’s more important than ever to have an education. Skilled jobs are more secure, offer higher pay and usually come with better benefits. Thankfully, you don’t have to spend two to four years earning an associate's or bachelor’s degree to start such a career while at the same time accumulating student loan debt.With the right certificate program, you can be trained in as little as one month to one year ! You will be recognized because you have nursing and medical skills and there is a job market out there that is only growing bigger each year and this is coming from the Labor Dept. and numerous newspaper and professional journal articles that continuously document this fact. Make money now !! The New Millennium Training Center, Ltd. Become a Certified Nurse Aide In as little as four short weeks! 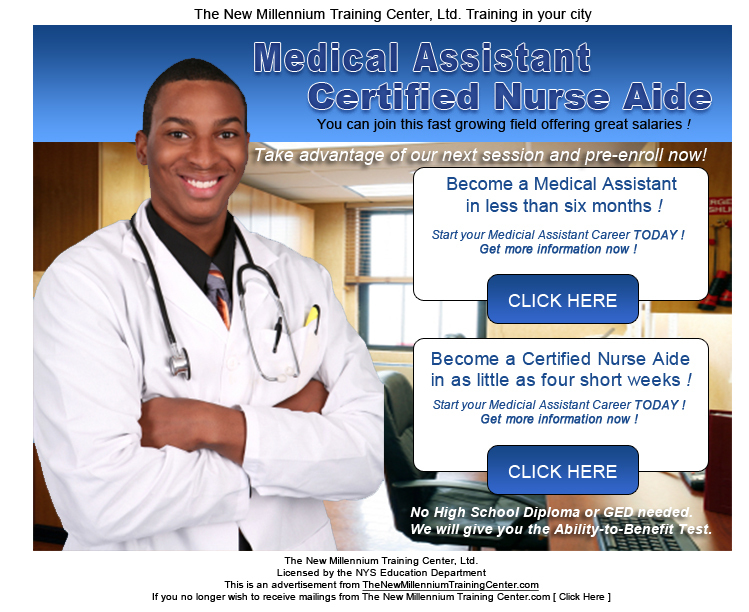 Become a Medical Assistant in less than six months! Take advantage of our next session and pre-enroll now! No High School Diploma or GED needed. We will give you the Ability-to-Benefit Test. WORKFORCE 1 Vouchers are accepted. We also accept VESID, HRA, G I Bill,FEGS, Seamens Society, NY Children's Foundling, and manyother organizations.We also have payment plans available. We offer job placement assistance. 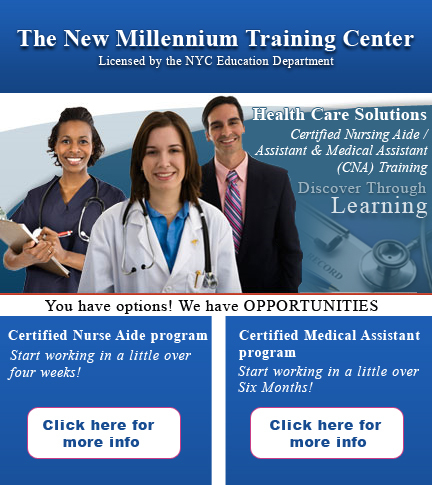 With 25 years of performing outstanding training and job placement assistance, nursing homes, hospitals, and rehabilitation facilities along with Doctors' offices, contact The New Millennium Training Center weekly requesting that we send new people for interviews, so its easy to understand why we are very successful when it comes to job placement assistance. We've received our most recent NEW YORK CITY TRAINING GUIDE REPORT CARD and we are happy to announce that we have the highest placement rates for Health Care Schools on Staten Island and the fifth highest placement rates for Health Care Schools in all of New York City! We have a completion rate of 95 % and a placement rate of 91 %. As of June 30, 2015 to the present, our NYC SBS report card confirms that TNMTC has nearly 100% completion and a very impressive job placement rate. This proves once again, that The New Millennium Training Center is consistent with overall positive training outcomes. Each month our report card is upated, but usually is consistent.